We could debate all day about whether the original Surface Pro was supposed to be more of a tablet, or a laptop with a detachable keyboard. Either way, we think we can agree on this: The original wasn't perfect in either role, not with its short battery life, heavy build and kickstand that wasn't designed to be used in the lap. Now, less than a year after it came out, we have the Surface Pro 2, which addresses many of the shortcomings we complained about on the original. In particular, it moves to a two-stage kickstand that sits less precariously on people's legs. A Haswell CPU, meanwhile, should take care of the battery life problem. Even the keyboard covers have received mild upgrades, though unfortunately, they're still not included in the $899 starting price. But does all of that add up to a real improvement? How would you rate the Surface Pro 2? With the exception of that dual-stage kickstand, this is basically the same hardware as the original. Sure, it's now made of two pieces of magnesium alloy instead of three, but the difference is so subtle you might not spot it even if you tried. For all intents and purposes, though -- and in all the areas that count -- the Pro remains unchanged. Chiefly, the dimensions are exactly the same as they were last year: 10.81 x 6.81 x 0.53 inches (27.45 x 17.3 x 1.35cm). And at two pounds, it's as weighty as the first edition. In some ways, it even feels heavier than we remembered. That's partly because the accompanying Surface 2 is noticeably lighter than its predecessor, the original Surface RT. But even the Pro now finds itself competing against some skinnier, lighter-weight rivals. Namely, Sony's 11-inch Tap 11 tablet, which comes in at 1.7 pounds and measures a much thinner 0.39 inch thick (and that's also with a USB port!). Thankfully, its build quality hasn't changed either. If a thin-and-light design is the main reason you'd want to buy the Tap 11, then top-notch craftsmanship is one reason you might still want to go with the Surface Pro 2. Once again, Microsoft's design team went with black magnesium alloy, and it's as tactile as it is minimal. Turned off, the tablet's metal surfaces feel smooth, cold and... expensive. Fortunately, it's also durable: The Pro emerged from my week of testing scratch-free, and with only a light dusting of fingerprint smudges. And that's even after I carried it around in a tote bag with other objects, like a wall charger and the included stylus. There are other nice touches. The magnetic connectors on the bottom edge instantly catch hold of the optional keyboard covers, so that you never have to guide them in. 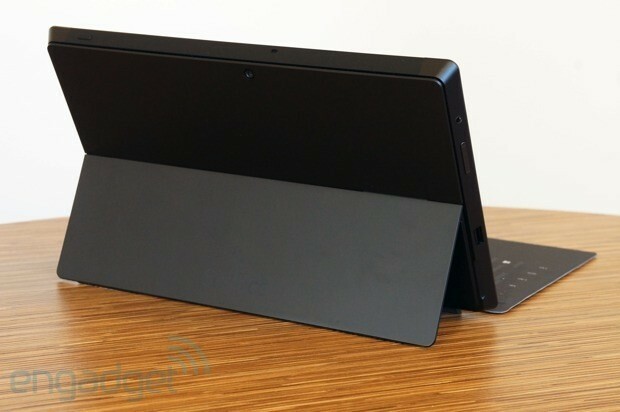 And once they're in place, you can dangle the tablet from the Type Cover if you want -- that thing is staying put. The kickstand, meanwhile, still makes a soft, satisfying "click" when you pop it back into place. As a bonus, Microsoft painted all the certification information and identifying specs (64GB, et cetera) underneath the kickstand, so that you rarely see it. With the tablet closed, all you'll see around back is some faint lettering spelling out the "Surface" logo. We told you it was minimal. 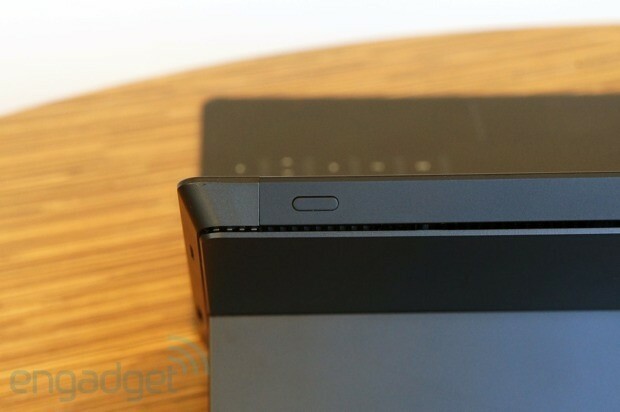 Similar to the hinge that allows the Lenovo Yoga's screen to fold all the way back, the two-stage kickstand here stops naturally at that first position, so that you have to push a bit harder to get it to extend all the way out. At no point does it ever feel flimsy, though; you can try to push the kickstand past its limit, but you'll never worry it's going to break. At the same time, it doesn't offer too much resistance. It's not an easy balance that Microsoft is going for here, that mix of smooth and sturdy, but its engineering team absolutely pulls it off. 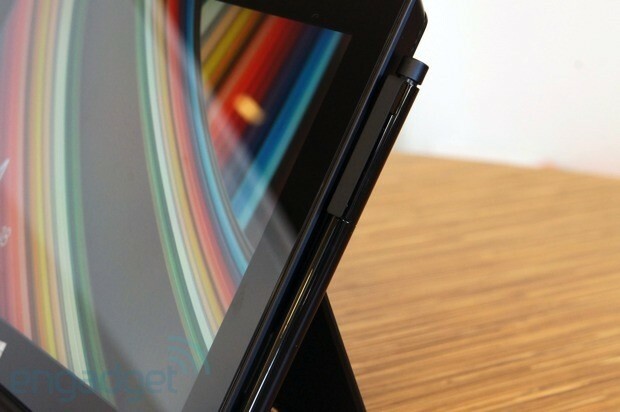 Our only complaint is that even after all this time, the kickstand can still be a pain to open, since there's only a notch on one side of the tablet (the left side). Having a notch on each end would make it easier to open the kickstand when we're cradling the device in two hands. So, about that two-stage kickstand: It's a pretty handy feature. I'll go on record here and say that I never thought the Surface was that uncomfortable to use in the lap, but I know many folks would disagree. Clearly, Microsoft heard their complaints, as this second kickstand setting was expressly designed so that the Surface would rest more comfortably on people's laps. There are a few things going on here. For one, as promised, it feels a little less precarious when the kickstand has a wider stance. In addition, the viewing angle is a little more pleasant, as it's no longer sitting quite so upright. Depending on how tall you are, and how high above the tablet you're sitting, you might really appreciate the option of arranging the screen at a slightly more face-up angle. Equally important, the kickstand digs into your legs less at that angle. It's still not as comfy as the Tap 11's kickstand, which has a rubber seal at the end, but it's an improvement nonetheless. Even wearing tights, I was able to comfortably set the device on my legs, which means all of our jeans-wearing readers should fare just fine. Drag your finger along the angled edges toward the back, and you'll be interrupted by a thin gap separating the sides and the rear cover. That would be the discreet ventilation system, which takes the place of traditional fan openings. This is also where sound escapes from the stereo speakers, which are hidden inside the chassis. The audio, as you'd expect, doesn't exactly go heavy on the bass notes, but the quality is generally pleasant enough. Its biggest crime? The volume isn't very loud, even at max settings. If you intend to do more than have a video conference or listen to music by yourself, you might want to pair it with a Bluetooth speaker. On the other side of the gap, you'll be met by all the usual ports: a full-sized USB 3.0 socket on the left, along with a volume rocker and standard headphone jack. Over on the right, you'll find the same Mini DisplayPort, along with the same proprietary charging connector and the same microSDXC slot. As before, the included pen has matching nubs allowing you to click it into the charging port. Lining it up against the tablet can sometimes be a practice in trial and error, but once it's in, it at least stays put. The all-important power/lock button, meanwhile, still sits on top, along with the solitary microphone. (Microsoft told us last time that the use of one mic, as opposed to two on the RT, was to keep it from picking up too much fan noise.) Rounding out, you'll find twin 720p cameras: one on the front, and one on the back. If you're curious about quality, you can revisit our Surface Pro review from earlier this year: Both cameras are essentially unchanged (which is to say they aren't very good). As far as wireless connectivity goes, the Pro offers a mix of 802.11n WiFi and Bluetooth 4.0 LE (the Surface 2 also has BT 4.0, but it's not Low Energy). On the inside, meanwhile, it brings TPM security for the enterprise -- something you won't find on the more consumer-focused Surface 2. In addition to the Surface Pro itself, both the Touch and Type keyboard covers have received modest updates. Starting with the $120 Touch Cover 2, it's slightly thinner than the original (2.75mm vs. 3.25mm) with a more rigid design and subtle backlighting that you'll only notice in dim conditions. More importantly, the flat keys promise greater keystroke accuracy, and can now support a few gestures they didn't used to, like sliding two fingers across the numbered keys to highlight text (you can delete the selected text by then taking your fingers off the keyboard). There's also a new space bar gesture that lets you quickly choose from spelling recommendations when you make a typo. Note: Neither of these gestures is for the dainty-handed. You'll need to exert a good deal of pressure to make either of them work. Speaking of typos, I don't necessarily buy that the Touch Cover 2 is more accurate than its predecessor. The learning curve is as steep as always, which is to say you'll probably start off typing slowly and deliberately to avoid making mistakes. You'll get the hang of it, I promise, but you'll also make your share of mistakes along the way. Even now that I've learned to trust the Touch Cover and let myself type at a faster clip, I still have trouble capitalizing letters using the Shift key. The Touch Cover 2 doesn't really help there. Microsoft is correct, though, that the keyboard is more rigid -- it's definitely less bendy than I remember it feeling. That should come in handy when you're using the device in your lap; on a flat surface, less so. Really, unless you're wild about the backlighting or those keyboard gestures, you could probably get away with buying the last-gen Touch Cover for $80 while it's still around. The $130 Type Cover 2 (the one with the physical keys) has also gotten a subtle backlight, along with a wider color selection (cyan, magenta, purple and black). Like the new Touch Cover, it also has a more rigid underlying panel, to help improve the typing experience when you're using the device in your lap. Additionally, Microsoft says it retooled the buttons so that they'd make less noise. It's hard to make a decisive call without a side-by-side comparison (we don't have a first-gen Type Cover lying around), but we'll say this: The buttons here make a low, pleasant noise when struck. Whatever the old sound was, we have no complaints about the new one. The fact that the buttons on the Type Cover are situated so close together means yet another opportunity for typos but, all told, we still find this keyboard easier to type on. The main tradeoff, apart from aesthetics, appears to be the added heft: This measures 6mm, more than twice as thick as the new Touch Cover. It also adds a little more weight, which perhaps you want to avoid, having already chosen the Pro over the lighter Surface 2 (and the lighter Tap 11). Whichever keyboard cover you choose, though, you'll find a small trackpad at the bottom, made of the same rough plastic used on the Touch Cover. Because it's so small, you'll mostly use it to drag the cursor in desktop mode, and to tap on tiny objects using a single-tap gesture. Technically, it's possible to click and drag, but after you pinch your fingers together to do it once, you'll probably avoid it thereafter. On the bright side, both keyboards do a good job responding to two-finger scrolls and pinch-to-zoom -- something about the touchpad's scratchy polyurethane surface seems to make it less prone to errant taps. Those are all the accessories we tested, since these are the only ones available to purchase. Starting in early 2014, however, you'll also be able to buy a $200 Power Cover with a built-in battery, along with a $200 docking station that brings three extra USB ports, an Ethernet jack, Mini DisplayPort and an audio in/out socket. That guy, in particular, should address a longstanding complaint about the Pro, which is that although it's configured like an Ultrabook, it doesn't offer as many ports. Still, that's a mighty expensive way to achieve parity. Also coming in 2014: a $50 car charger with a built-in USB port. There's one other accessory, and it's actually available now (though we didn't get to test it). That would be the $60 wireless adapter, which latches onto either the Type or Touch Cover to turn it into a Bluetooth keyboard. Much like the rest of the hardware, the Pro's screen has stayed the same for 2013. 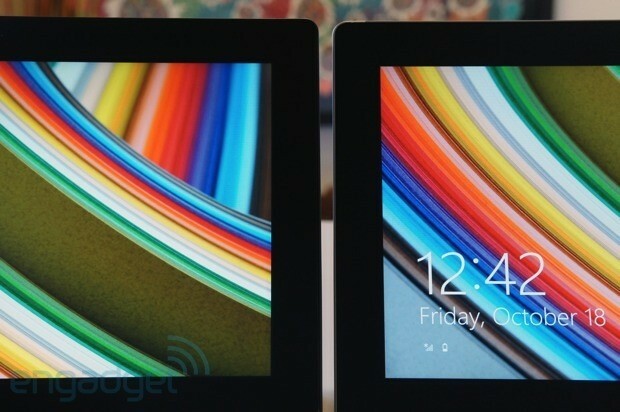 Once again, we're looking at a 10.6-inch, 1,920 x 1,080 display. In addition to being an IPS panel, it's optically bonded, so that there's minimal space between the glass and touchscreen, resulting in reduced glare. Also, like last time, it makes use of Microsoft's ClearType sub-pixel rendering technology to help smooth out jagged edges. All that still adds up to a lovely display, one with good contrast, wide viewing angles and a bright enough backlight to be usable even outdoors. The pen experience hasn't changed either. Here, too, Microsoft went with a Wacom digitizer that recognizes 1,024 degrees of pressure sensitivity. Whether you want to draw a faint line or leave a thicker marking, you'll have plenty of flexibility in the sort of scratchings you'll be able to produce. Even outside of drawing apps, note-taking is also a smooth experience; it's unlikely you'll ever have to go back and re-trace your letters because they didn't register the first time. All in all, Wacom might still be the best in its class, though we also had a similarly good experience with N-trig's digitizer in Sony's new Tap 11. We know, we know, that won't be enough to convince some of our more snobbish readers, but to most consumers, the experience should be on par. It's no coincidence that the Surface Pro 2 is going on sale just days after Windows 8.1 came out: Microsoft's new tablets are meant to be centerpieces for the company's latest software update. If you haven't yet read up on 8.1, we'd encourage you to check out our exhaustive screenshot tour, which breaks down not just the new UI features, but also the new built-in apps as well. Speaking of new UI elements, you've probably heard by now about the "return" of the Start button. Indeed, there's now a Start button fixed in the lower-left corner of both the Start screen and the desktop, but clicking it just takes you back and forth from one to the other; if you were hoping for a return to the old-school fly-out menus, you can keep dreaming. 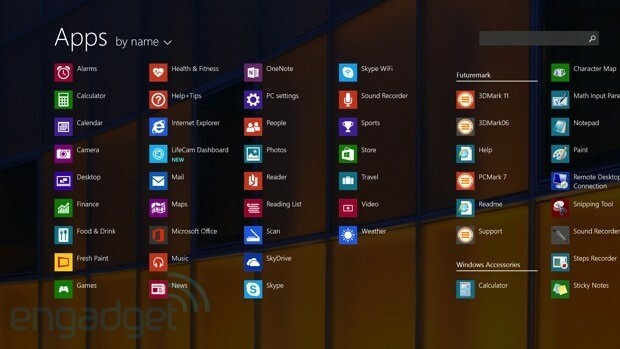 What's nice, though, is that Microsoft added an option to keep the same wallpaper for both your desktop and Start screen, so that the transition from one to the other feels less jarring; it almost looks like the Live Tiles are floating on top of your desktop. One of our favorite features, actually -- we suggest you try it out. Otherwise -- and this is just a recap here -- you can snap more than just two windows side by side on-screen, depending on the size and resolution of the display you're using. You also get more flexibility in terms of how much space every window takes up; it no longer has to be an 80/20 split. Other changes: You can take photos from the lock screen, and accept Skype calls too. Users now have more tile sizes to work with, including an extra-wide one and a tiny, quarter-sized one. You also have more options for arranging your app list, so that alphabetically isn't the only option. The on-screen keyboard has received some neat shortcuts, which should be especially useful on all those smaller 8-inch tablets, which are easy to type on in portrait mode. Search also works differently in Windows 8.1. For starters, you can do more just from the right-hand pane where the search results usually appear. From there, you can open apps, click on web results or even play music from the Xbox Music app. More importantly, perhaps, the OS can now create on-the-fly "apps" (for lack of a better word), which pull together all sorts of information on a given search result. For instance, a search for "Istanbul" would combine images, news, maps, a Wikipedia entry -- you name it. Just scroll through it from left-to-right inside the app, as it were, and when appropriate, you'll be redirected to other apps, like Maps. Finally, 8.1 adds a number of native applications, including Health & Fitness and Food & Drink, along with a calculator, alarm and sound recorder. Also, you'll want to check out the Photos app, even if you think you hate taking pictures on tablets: The app has gone from being spare and rudimentary, to actually offering some great editing features. Our favorite is Color Enhance, which lets you adjust the color on a specific part of the photo using an intuitive on-screen dial. Definitely a must-see as you're giving yourself a tour around the new OS. We'll never be sure what sort of sorcery Microsoft performed behind the scenes, but we know this: The Surface Pro 2 is fast. With the same Core i5-4200U processor and Intel HD 4400 graphics found in lots of new Haswell Ultrabooks, we assumed it would perform in line with all those other PCs. In reality, though, it outpaces them on most metrics, especially graphics. And remember: That's with the standard 4GB of RAM; imagine what the higher-end configs with 8GB of memory can do. Now we confess, these performance numbers aren't totally surprising, as Haswell has tended to improve GPU performance more than CPU-intensive tasks. Still, we weren't expecting the kind of leap we saw between the Surface Pro and the Surface Pro 2. And we definitely weren't expecting it to outperform notebooks -- the sort of machines you'd actually want to use for gaming and video editing. The solid-state drive's read speeds hold steady at 534 MB/s, though writes remain slower than average at 167 megabytes per second (we've been testing a lot of PCIe SSDs recently, which make mSATA drives like this look bad.) On the other hand, the Surface Pro 2 lays claim to one of the fastest startup times we've logged recently -- just six seconds to the lock screen. In general, too, everything moves quickly and fluidly -- cycling through open apps, launching programs, swiping up into the app menu and pressing the Start button to get back home. Throughout, the tablet tended to get warm on the back side, especially while running benchmarks, but it never became hot, per se. Besides, when you're using the most CPU-intensive apps, you'll probably be working in kickstand mode, at which point you won't be having much physical contact with the back side of the tablet anyway. If you look up the Surface Pro 2's specifications on Microsoft.com, you'll see the company doesn't say how long the tablet's supposed to last on a charge, except that you can get anywhere between seven and 15 days of idle time. That may have been an overly cautious move on Microsoft's part, as the battery life is actually much improved this time around. Whereas the original could barely crack four hours, this year's model lasted through six hours and 27 minutes of uninterrupted video playback (that's with WiFi on and the screen brightness fixed at 65 percent). Under less-taxing conditions -- a lower brightness setting, more intermittent use -- you can surely eke out even more runtime. So how does that showing stack up against everything else on the market? That all depends on what you choose to compare it to. When we home in on the Sony Tap 11, a veritable Surface Pro knockoff, the real Pro looks like the better tablet: It lasted more than an hour longer in the same battery life test. It's also on par with the one 11-inch Haswell Ultrabook we tested, the Sony VAIO Pro 11. Still, while six hours and change might be good for a Core i5 tablet, it's a pittance compared to what you'd get from most Ultrabooks. You can blame Intel, if you like, for setting the bar so high with its Haswell chips, but at this point, we expect that even the skinniest Ultrabook will last at least seven and a half hours on a charge. Most, though, last somewhere between eight and half and 10, with one freak of nature managing 12.5. In Microsoft's defense, the Surface Pro 2 weighs nearly a pound less than those Ultrabooks we're referring to (all of which have 13-inch screens). A smaller device means a smaller battery, which means less battery life; makes sense to us. Still, PC makers have been steadily slimming down their Ultrabooks, and dropping the weight in the process. At this rate, they're likely to narrow the gap, especially if Microsoft keeps the Surface Pro's weight steady around two pounds. What we're saying is, if we review the Pro a year from now and it doesn't weigh much less than all of the Ultrabooks it's competing against, then we might not be as forgiving as we are today. As we said up front, the Pro doesn't come with a keyboard in the box, so whichever configuration you choose, you're looking at an extra $120 or $130, depending on whether you want the Touch Cover or Type Cover. Got it? Good. Here are your options. The base 64GB model costs $899 and the 128GB version costs $999. Both of these have 4GB of RAM. Once you move up the line, to the 256GB model ($1,299) and the 512GB version ($1,799), you actually get eight gigs of memory instead of four. Regardless, other key specs remain the same: The Surface Pro 2 always comes with a Core i5 processor, Intel HD 4400 graphics and a 1080p IPS display that supports pen input. (And yes, the pen, at least, comes in the box.) Also, all Surface owners get a few goodies for free. In addition to 20GB of free lifetime SkyDrive storage, you're entitled to 200GB of free SkyDrive space for two years. On top of that, Microsoft is throwing in one year of free voice calls to landlines on Skype. Users also get a year of free WiFi access at Skype hotspots. 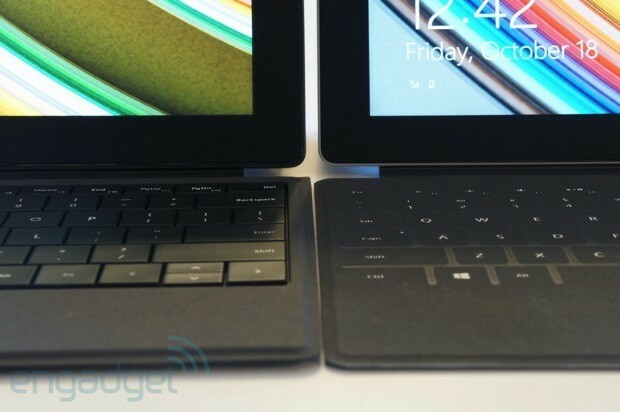 OK, sure, we got a bit snarky, calling Sony's VAIO Tap 11 a Surface knockoff. And, we mean, it is, but you should still consider it as an alternative. Its big selling point, as we said earlier, is that it's significantly thinner and lighter than the Surface Pro 2, making it easier to use as a proper tablet. It, too, has a 1080p screen that supports pen input, and it's also lovely. What you'll lose if you buy this, though, is the attention to detail that Microsoft brings to the table; the Tap 11's plastic body has just a bit too much bend and flex for a product this expensive. Speaking of which, don't be fooled by the price tag: although it starts at $800 with the keyboard and pen included, that's with a Pentium processor, not one of Intel's fourth-generation Haswell chips. If you were to configure it with a Core i5 CPU, it'd cost about the same as the Surface Pro 2. Otherwise, there seem to be fewer and fewer 11-inch Ultrabooks to choose from: Samsung and Acer have both discontinued their smaller offerings in favor of their 13-inch models. Carrying the torch is Sony again, with the VAIO Pro 11. Starting at $1,050, it comes standard with the same Core i5-4200U processor, 4GB of RAM, a 128GB SSD, NFC and a 1080p IPS screen. 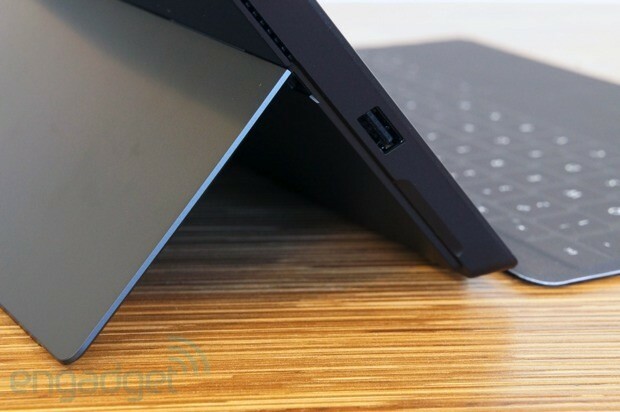 At 1.92 pounds, it actually weighs less than the Surface Pro 2. The battery life, meanwhile, is on par with Microsoft's tablet. What you'll sacrifice, though, is the option to use this in tablet mode; while it does have a touchscreen, it's ultimately just a regular clamshell laptop that supports touch. Beyond that, there's a host of 12- and 13-inch convertible Ultrabooks that can be used in tablet mode, but you'd have to be OK with the idea of having a device that's a notebook first and a tablet second. (The Surface Pro is, arguably, the opposite.) Of these, the ones you should be considering are the Acer Aspire S7-392 ($1,400-plus), the Samsung ATIV Book 9 Plus ($1,400-plus) and the Dell XPS 12 ($1,000-plus), all of which offer sleek designs, fast performance and at least seven and a half hours of battery life (thanks, Haswell!). Also worth checking out: the Lenovo Yoga 2 Pro ($1,049-plus). With a 3,200 x 1,800 screen and slimmed-down, three-pound design, it looks very promising; we just can't vouch for it yet since we haven't had a chance to review it. When it came time to hand down a verdict on the first Surface Pro, we ultimately decided that, nice as it was, it felt compromised as both a laptop and a tablet. We wouldn't go so far as to say the Surface Pro 2 addresses all of the original's shortcomings, but it's definitely made progress. In particular, this new model brings a series of changes that make the Pro more viable as a laptop replacement. The dual-stage kickstand makes it comfortable to rest on your legs. The two keyboard offerings are each less bendy this time around -- again, making them more suitable to use in your lap. With the help of Haswell (and some extra tweaking from Microsoft), it's actually faster than a notebook in many respects. Also thanks to Haswell, the battery life is vastly improved, to the point where it's on par with a similarly specced 11-inch Ultrabook. As a tablet, the Surface Pro has made fewer strides. And that's a shame, since the Pro is, at its heart, a tablet. (If it's not, then why are the keyboard covers sold separately, and why is there no full-sized SD slot?) The improved battery life helps, sure, but the Surface Pro 2 isn't any thinner or lighter than its predecessor, and can be cumbersome to use as a standalone slate. If there's a bright side, it's that the Surface Pro is still easier to use in tablet mode than a convertible PC, like the Yoga 2 Pro. You'll also enjoy a wider selection of apps than when we reviewed the original, and certain Windows 8.1 features, like those on-screen keyboard shortcuts, are super convenient in tablet mode. Even so, we hope that as Microsoft sits down to plan the Surface Pro 3, it focuses on building a better tablet, the same way it made the Surface Pro 2 a better laptop. In the meantime, the new Pro is much improved, but it's still at its best in notebook mode. Indeed, whoever buys this needs to want a tablet and laptop in more or less equal measure. Because if what you really want is a laptop you can occasionally use as a tablet, you're still better off with a convertible Ultrabook. Edgar Alvarez and Daniel Orren contributed to this review.